Like you, we read. Lots. Old books are like good friends. Seton, and Burgess, and Holling….and Hillyer. Lots of V.M. Hillyer. I would gather the children and we would trek out into the world with Hillyer through his book, “A Child's Geography of the World” and go exploring God's world from the couch. We loved how Hillyer spoke directly to us, how we developed a relationship with the author himself, how he romped through the world, teaching us along the way. But we always had questions. Hillyer's geography was old-maybe too old? The world had changed. And we wanted to know what the world was like now. And we wanted to see God's Hand in it all - for the Earth and everything in it is His. Thus this project, a "living" geography primer for grammar age students, (gr.1/2--gr.6/7). “A Child's Geography: Exploring His Earth” is about getting to know what's under our feet, over our heads and in the world around us-the atmosphere, the hydrosphere, the lithosphere-and then how to get around this world-maps, latitude and longitude. Do you know how many gallons of water float in a cloud over our head-how far it is to the center of the Earth-what causes magnificent auroras, God's love lights-how God used the Flood to puzzle our planet into different shifting plates? Well, hop on board to experience Adventures for the Inquisitive Child-and every excursion glorifies our breathtaking Creator! "A Child's Geography: Explore His Earth" is, in some ways, really like exploring and scouting out various routes before a grand trip! While scouting and surveying the grand scheme of things, the sciences of His Earth, our appetite is whetted for the real march out, the countries of this Earth. The anticipation builds as we learn about the workings and the ways of His Earth. 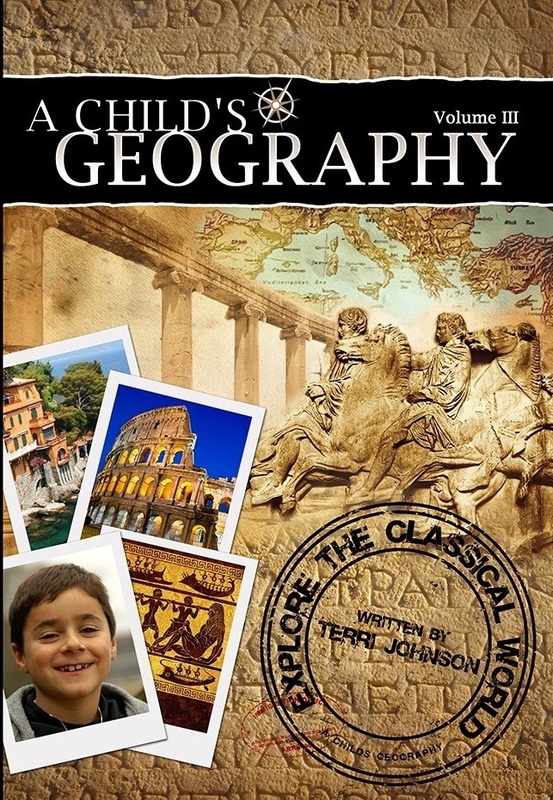 Then, having gained our bearings in "Explore His Earth," future volumes of "A Child's Geography" will follow the same traditional path of our chronological study of history, trekking through the countries of our world today. This is a complete, stand-alone Science and Geography Curriculum. CD-ROM includes reproducibles in the form of copywork passages, copywork templates, postcard templates, quizzes, world and continent maps, and more. Click the "Add to Cart" button to get your copy! Take advantage of a great offer! 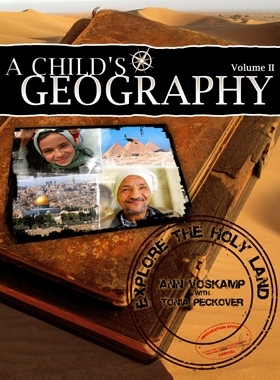 Buy the first two books (A Child's Geography: Explore His Earth and A Child's Geography: Explore the Holy Land) and receive even greater savings. Quantity: $59.90 (reg. $67.90) for both books and CDs. Take advantage of our best offer! Purchase Volumes 1, 2 and 3 of A Child's Geography and save! Now on iBooks! 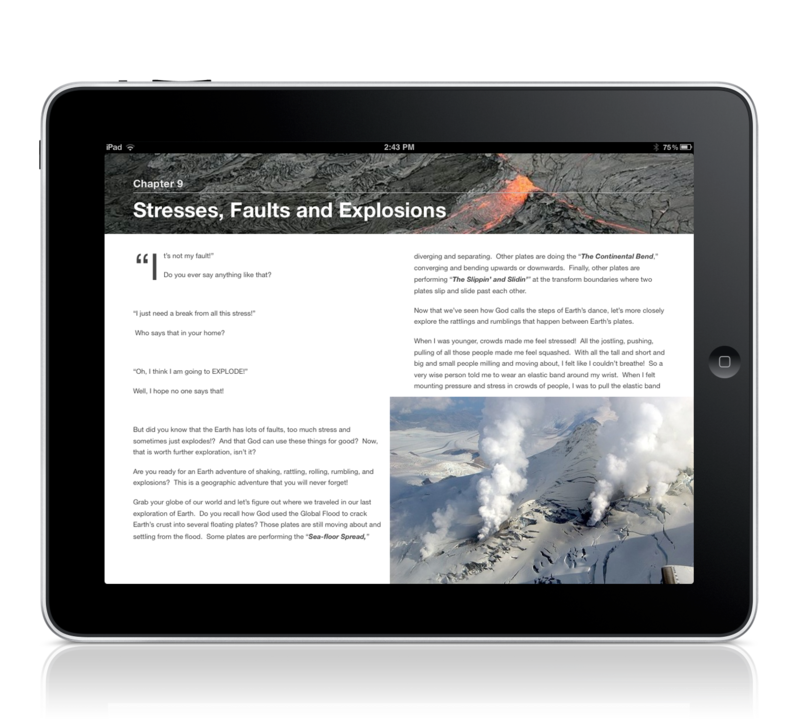 Do you have an iPad with iBooks2? Then you can grab the very same A Child's Geography as an iBook texbook. You get everything that is included in the book and the accompanying CD-ROM at a fraction of the price - just $9.99.